The effects of inflation really hit home when we stop working and expenses increase faster than income. You might ask, how do I “know” inflation will continue in the future. Last month, I cited some statistics on historical inflation. This month, I’d like to examine some of the factors driving inflation. The U.S. Federal Reserve wants our economy to experience inflation. You may have heard the terms “quantitative easing” and “zero interest rate policy.” In plain English they mean, respectively, “printing money” and “keeping interest rates really low.” These policies, implemented in response to the recent financial crisis, are intended to restore growth and to battle deflation, the risk that prices fall (which is a much worse can of worms.) While they have helped avert a nasty deflationary spiral, employment growth is still insufficient. The Fed intends to continue these policies until the desired effect is achieved: more jobs and higher inflation. The federal government also wants to encourage inflation. In the downturn it borrowed money to stimulate growth in the economy. Over time inflation decreases the value of the money borrowed. Inflation is good for borrowers and bad for lenders (bondholders.) Think of the bottle of wine. I borrow $20 to buy a bottle today. I pay interest every year (like a bond) and pay back the principal, $20, years later. By the time I pay it back, the $20 doesn’t buy as much as it did when I borrowed it, due to inflation. 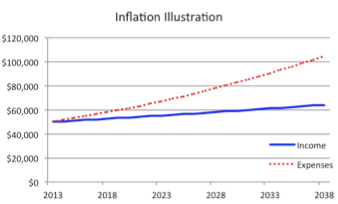 From the government’s point of view, inflation functions to reduce the debt burden. Pretty clever, huh? These powerful forces ensure that inflation will continue. Like an invisible tax, it erodes our purchasing power, putting us at risk for running out of money later in life. As the pace of economic activity increases, the money printing of the last few years will turn up the burner on inflation. If the Fed doesn’t manage things well, the rate of inflation could be even higher than we estimate. Our best defenses are planning and wise investing. Plan ahead, keeping inflation in mind, and invest in assets that will appreciate in value over time.